WASHINGTON, D.C. — The Aspen Institute’s Center for Native American Youth (CNAY) will celebrate its sixth cohort of CNAY Champions for Change through a series of recognition events in Washington, D.C. in February. The 2018 Champions include Damien Carlos (Tohono O’odham Nation), Isabel Coronado (Muscogee Creek Nation), Shawna Garza (Kickapoo Tribe of Oklahoma), EllaMae Looney (Confederated Tribes and Bands of the Yakama Nation), and Anthony Tamez (Wuskwi Sipihk First Nations Cree and Sicangu Lakota). Collectively, the 2018 Champions are working to connect Native youth with the healing power of tribal lands, reintegrate formerly incarcerated Native Americans, advocate for Native youth in foster care, revitalize Native languages, and eliminate race-based mascots, among other important change initiatives. Champions for Change is the Center for Native American Youth’s flagship youth leadership initiative. Each year, CNAY selects five up-and-coming Native change makers between the ages of 14 and 23 to serve as Champions. CNAY works closely with each Champion to develop their leadership and advocacy skills through tailored resource sharing, mentorship, skill building and networking opportunities. The Champions will share their stories at a panel discussion Feb. 13 in Washington. Damien harnesses the healing effects of ancestral lands to help Native youth battle feelings of isolation and depression. 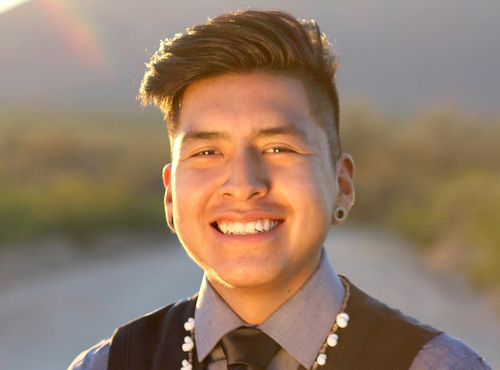 In connecting Native youth to Mother Earth and Tohono O’odham culture, Damien builds relationships with young people that help them reconnect, build confidence and recognize their self-worth. In addition to being a student at Tohono O’odham Community College, Damien is founder of the I’oligam Youth Alliance, an Earth Ambassador for United National Indian Tribal Youth, Inc. (UNITY), and serves on the Tribal Youth Health Advisory Board for the National Indian Health Board. After witnessing the effect of incarceration on Native communities in her home state, Isabel helped create the American Indian Criminal Justice Navigation Council. AICJNC is an initiative of the Southern Plains Tribal Health Board that trains successfully reintegrated ex-offenders to help others navigate the criminal justice system. The program includes a special support group, where Isabel helps give a voice to children with incarcerated parents. Shawna grew up in foster care and is working to counter stereotypes of Native American foster youth. By striving to be a mentor and leader in her community, Shawna hopes to inspire other youth to break intergenerational cycles of abuse and addiction. Shawna is a role model to her younger siblings and peers alike, encouraging Native youth to graduate and reach for their dreams. Anthony Tamez challenges misconceptions about urban Native youth. As co-president of Chi-Nations Youth Council in Chicago, Anthony leads Native youth in medicine walks to harvest ancestral plants, participates in demonstrations like the Standing Rock movement, helps young people with regalia making and more. Anthony is also passionate about advocating for the elimination of race-based mascots that promote stereotypes, and works against the ongoing erasure of indigenous people in what is now known as “Chicago”. 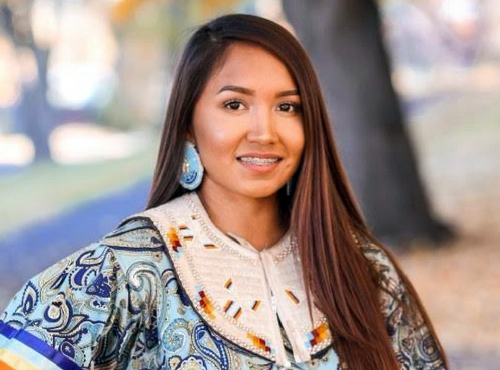 EllaMae advocates for language revitalization among Native youth in Oregon. She’s learning all three Native languages spoken in her tribal community – Walla Walla, Nez Perce and Umatilla – and is surveying Native youth to determine how to best deliver language lessons. EllaMae believes that language is a critical aspect of Native American identity.